The sun is so hot that it gives off enormous quantities of ultraviolet (UV) photons. These can damage the DNA in your cells and cause skin cancer. The cells of all organisms have ways of repairing most of the DNA damage caused by UV photons. But occasionally the cell's repair machinery makes a mistake which results in a mutation, an error in one of the cell's genes. Many scientists believe that mutations in skin cells sometime cause skin cancer. While sunburn is an immediate effect of UV damage, mutations that may lead to skin cancer accumulate over a long period of time. While studying the effects of UV on mutation, scientists often use single cell organisms such as yeast and bacteria. Since you can easily use millions of such organisms in each of your experiments, even a very small chance of mutation is enough to successfully find mutated cells. Short life cycle and quick reproduction of such organisms make it possible to see the experiment results in relatively short times. Experimenting mutation needs some general knowledge and skills related to growing microorganisms. Such information is not included in a project guide. If you don’t have knowledge and skills of growing microorganisms, you may have a hard time working on this project. You will need to prepare yourself for such project by learning about and practicing bacteria growth on nutrient agar plates. In this project you will study cell mutation in yeast. 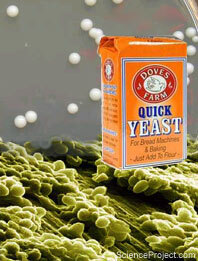 You may expose yeast samples to UV radiation and look for changes that may have been caused by mutation. This is a difficult and challenging project for advanced and experienced students. If you select this project, you are on your own. No support and no project advisor is available for this project. Material needed for experiments are almost the same as bacteria growth experiments. You must be able to obtain or prepare nutrient agar plates and UV light for this project. If you don't know what these things are or where you can get them, this project is not for you.